In the Fante language of Ghana, West Africa, Nyame te Amen Beebiara means God Hears Amen Wherever We Are. We believe that we can all help each other because we are all connected-- no matter where we are! Featuring stories and news from several orphanages: New Life International, Sankofa Children's Home, Lucky Hill Orphanage, and Families for Children International in Ghana. Our goal is to increase awareness of needy, vulnerable and orphaned children in Africa. Over at Reach for the Stars, we're holding a raffle to raise money for 5 kids from New Life to go to high school! For as little as $5 bucks and spreading the word, you can get up to five entries for some amazing handmade Ghanaian prizes. So what's the story? When I was 20, I ditched college and took off for Africa. I thought it would be the adventure of a lifetime, and it was. But it ended up being so much more than that. For four months, I taught the children at New Life International Orphanage and learned more about patience and love than I had in the last twenty years of my life combined. I made friends and learned to live in a different world. Most importantly, I realized that it was real life for the people in Ghana-- not the amazing adventure I'd come for. When I was 20, I ditched college and took off for Africa. New Life and Sankofa Updates! "I've talked to David and he sounds like such an amazing person. I'm so excited to be able to help out with the things he wants because he has such distinct plans for what he wants the school to become and how he is going to do it, he just needs the means. To begin he says he wants to do a full-scale farm with chickens, goats, cows, really randomly ducks, and all sorts of veggies to help pay the teachers salaries and feed the kids so we're gonna finance that. People in the village have also offered there land because they're so grateful for everything he's done. Sarah [Frank] says shes working with BlueKitabu to set up an internet cafe as well but I'm very removed from that so don't have any other deets on it. "For New Life Derrick says he wants a technology center so we applied to Computer Aid for 10 computers. I actually think we have a really good shot of getting them and then we can add all sorts of educational games for them that I really hope they actually use. Do you remember John and Nicholas? They want to put him into an apprenticeship so he can learn a trade and then there are 5 children going into high school who will need help funding and lots of others in the coming years going so we'll help fund that too. I'm positive we'll have enough money for that and then depending on how much the farm costs (David hasn't gotten back with an estimate yet) I'm pretty sure we'll have enough money to sponsor Gloria to go to university or whatever education she would like after high school. Depending on how much we can save in the future I'm hoping we can sponsor other kids for university too. "I am so excited for the opportunity to be able to work with David. His ability to make something from absolutely nothing is awe inspiring and I feel like with just a little bit of help he can do so much for the kids." Again, it's been a while! I'm so busy right now I'm afraid blogging just doesn't happen much. I don't have many new updates, just that things are going well at New Life, and Sankofa is still in need of help and donations. Hopefully, a former New Life volunteer who is doing an internship in Senegal will be able to help a bit at Sankofa soon! I'll post details when I know more. 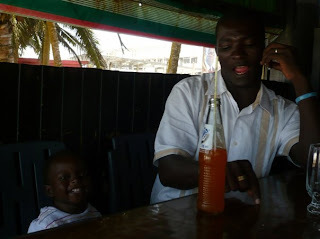 So in the meantime, how about an "Impressions of Ghana" post! When I first went to Ghana, I had a friend ask if I had thought they all lived in trees. I hadn't, but I also hadn't pictured the things I saw. Like most Westerners, I saw Ghana as rural villages with grass-leaf huts. While there are places that look like that, there's a lot more to Ghana! This is the Independence Arch in Accra. It's a symbol of their independence, with the country's motto "Freedom and Justice" and the year "AD 1957" emblazoned on it. The black star is a symbol of African freedom (even their soccer team is called the Black Stars). Traffic in Accra is comparable to traffic in any big city. It's loud, noisy, and crowded! Accra is a big city in every sense of the word. This is a main intersection in Cape Coast, with the crab monument in the center (the crab is a symbol for Cape Coast's booming fishing trade). Lined with houses, shops, and small stands, it is often crowded with cars and pedestrians fighting for space, as there are few, if any, sidewalks in Ghana. Cape Coast has the feel of a still large but more urban city. Not all streets in Ghana's cities are paved-- many side streets, even in larger cities like Cape Coast, are packed dirt. In smaller cities, there may not be any paved streets at all. Some villages in Ghana are very unique-- take Nzulezo stilt village, for example. The village is built over a lake in the Amansuri wetlands, and the only way to get there from the town of Beyin is by canoe. The town has it's own "main street" (a main wooden walkway through the town), and it's residents live quite normal lives, cooking, fishing, working, going to school, and going about their lives just as anyone else might. There are many shops in Ghana lining the streets. This one, outside Kumasi in 2005, was one of my favorites. If you look closely, you will see that this artist/sign painter chose to depict Osama bin Laden, George Bush, and Sadaam Hussein. Look even closer, and you will see the two Middle Eastern dictators looking quite pleasant, while George Bush looks rather fierce. I found this incredibly amusing. There are, of course, those mud huts featured so prominently in Western movies and television. In the north of Ghana, these homes often have flat roofs to allow for drying grains or other things on the roof in the hot sun. You may notice a wire leading from a stick through the home's wall-- it has electricity. This village, near Nkoranza in more central Ghana, is also a common Westerner view of Ghana. Mud huts, again, but with thatched palm or corrugated tin roofs rather than flat ones. Here is a view of a portion of Cape Coast. Here, houses are built primarily of concrete, which weathers the climate of Ghana quite well. Apartment buildings and individual homes may often be more similar to Western homes than many expect-- they have tile floors, televisions, and furniture often reminiscent of something in your own home. Here is another example of Ghanaian culture-- Elmina Slave Fort. These "castles" dot the coastline of Ghana, and were used in older days as forts for the various colonizers and ports for shipping out slaves. Many are now museums dedicated to remembering this tragic past with a promise never to repeat it. Religious buildings, such as this beautiful mosque, are common in Ghana. Christian churches and Muslim mosques often stand near each other, particularly in the south (the north is primarily Muslim). Religious tolerance in Ghana is quite high. Here is an example of a Christian church in Accra. The temple of the Church of Jesus Christ of Latter-day Saints is a beautiful representation of the strong Christian presence in the south of Ghana. Sorry for the long silence! What with the last trimester of pregnancy and being a new mom, I've had a lot on my plate! I'm enjoying being a mother, and now have a little time to do some updates, and maybe some more Issues and Impressions posts in the near future. You'll notice that New Life has a new webpage! It's the same address, but the site has been completely revamped and looks great! Check it out if you get the chance. Also, two volunteers, Lanaya and Mason, traveled to Ghana last month! Mason has since returned home, but Lanaya is still volunteering. She spent some time at Sankofa, and is now enjoying working at New Life. On the volunteer note, 15-year-old Emma and her mother are hoping to travel to Ghana this December! 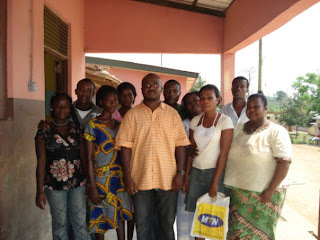 They are going to be working with David at Sankofa, and are trying hard to raise money for the trip and for the school. 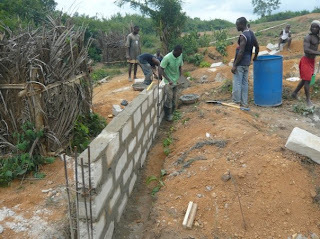 On the school note, David has managed to get some donations, and the school building has been started! We're so happy about this, and grateful to those who have helped in any way! Here are a few pictures! David with one of the children. The new school is finally going up! The kids at New Life are doing well. Currently, Zoe, a former volunteer, has returned and is enjoying her time with the children. We're hoping for more updates on her return! Sankofa is not doing so well at the moment. David is struggling even to be able to pay the teachers, who have now gone on strike. Several of us are looking into strategies to help with management of the school and orphanage. 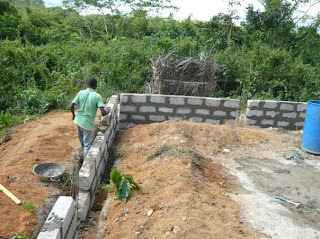 In good news, David states that enough donations came through to put in a foundation for a permanent school building, and the parents in the village are eager to contribute to the labor. Of course, more funding is needed to finish buying the materials. If you would like to contribute to the building effort, or (more importantly at the moment) to the teacher's fund, please visit www.chworldwide.org. On the adoption front at Lucky Hill, things are going very well! Many children have been able to join their families, including Comfort, a special young lady with heart problems. After successful surgery, she is now recovering in the arms of her family. We wish the best to all the children at Lucky Hill, and pray for those still waiting to join their families! See Lucky Hill's Yahoo group for more information. Work on the school building and hostel for Families for Children is going slow. The hope is to get the hostel built first. Once completed, it will provide a place for volunteers to stay, as well as any travelers, local or foreign. It will also hopefully provide revenue for the school, as well as vocational training to the older students, making the program sustainable. If you would like to make a contribution to this effort please contact Shallee for information on making a tax-deductible donation. For a few more pictures and stories from our June 2008 volunteer trip to Sankofa Children's Home and School in Ghana, please go here! (I'm afraid I was too lazy to repost all those pictures again on this blog...) These are some new pictures taken by several of the volunteers, with the stories that go with them! I apologize for the lack of recent posts. I'm happy to say, it's due to good news on my part-- I'm pregnant! Now that I have crossed the second trimester threshold and have a little energy, I'll hopefully be a bit more diligent about posting. Today, I'd like to give you a message from Derrick Gaisie, director of New Life International Orphanage, on the importance of education. It's a little long, but an excellent look at rural education from an insiders point of view. If you would like to donate to help New Life continue to provide for students in rural areas, please go here! "Growing up poor in isolated rural areas and small towns is qualitatively different from growing up poor in the cities. Yet most of what experts know about the effects of poverty on children’s development comes from studies conducted in big cities. The development of every child in the early days of its childhood is understood to be foundational for later cognitive and social development and early success in school. However, knowledge of relations among cognitive and social-emotional aspects of self-development in childhood and the relation of child characteristics and early experience to developing self-regulation is quite limited. Poverty is associated with stress and increased risk for poor child outcomes in the transition to school. Poverty is likely to disrupt family processes that are critical for establishing early childhood competencies associated both with cognitive and socio-emotional development and success in school. Children living in rural areas do not have access to quality educational structures like tables, chairs, or conducive classroom blocks for teaching and learning which in the long run affects how best a child grasps knowledge impacted to them by the rural teachers. Particularly important in this project is the measurement of the quality of childcare/ Head Start experiences from birth through school age through actual observation of the care setting in the rural homes, the observation and transcription of book reading experiences in the home by both mothers and fathers, and the observation of the quality of instruction in the elementary school classroom as children make the transition to formal schooling. The above issues are very much critical to the children under review and under the care of New Life International [which is located in a rural area]. About 70 per cent of the poor live in rural areas. Ghana is located on the west coast of Africa and the central region is a coastal stretch of land from the boarders of Accra being the capital to the demarcation separating central region from the western region. About 70 percent of people make a living from the primary industry, mainly agriculture; and education is an essential prerequisite for reducing poverty, improving agriculture and the living conditions of rural people and building a food-secure environment. Education is a basic right in itself. In spite of this, children's access to quality education in rural areas is still much lower than in urban areas, adult illiteracy is much higher and the quality of education is poorer. Expanding access to quality education for rural people is thus of crucial importance in the realization of human rights for all and in achieving the Millennium Development Goals (MDGs). New Life International as a non-profit, non-sectarian and non-governmental but charitable organization has planted its self in the middle of a rural certain in Cape Coast, central region of Ghana to offer quality education to children who are orphans, vulnerable and needs protection/Training, and to serve as an educational hub in that location (Ansapatu Village near Cape Coast). It is an educational hub in the sense that children in that locality find it extremely difficult to read, understand and pass their exams and this has become a problem for all rural children. NLI has been able to build three classroom blocks which is currently serving as a school for primary education KG 1-2, Nursery and primary 1-6 for less fortunate children (orphans, vulnerable and needy children) in the community. There has been a lot of changes in Ghana’s educational policy and gradually improving. The facilities that we have now are not the best but needs immediate improvement. The size of our 3 classroom blocks are becoming smaller and the number of children admitted into the school is growing everyday. At the moment we are running 3 class groups in one room. The congestion and the instance where one class group will have to read aloud whiles the other class needs concentration to learn and etc are our fundamental problem.This phenomenon has brought about the need to separate all classes from each other. Kindergarten 1, 2, nursery and class 1 are run in one classroom block. Classes 2, 3, 4 in another classroom and 5 and 6 are also in another room. Again, Ghana Education Service, the oversight authority of Ghana’s education in the district has given some recommendations of change and as a result, New Life International should and must construct 9 classroom block so that we can separate the classes to enhance teaching and learning. Secondly, as part of the new educational policy in Ghana, every school must have what we call “ICT center” where some amount of computers are wired and functional for the children to use as part of their core subject(computer studies) when they write their ninth grade exams nationwide. (JHS EXAMS) These computers would help the children and the surrounding communities to learn computer studies and enhance their knowledge in computer technology as the world is now globalized. This is educational policy. The statistics that is characterized by school drop out in the area between the ages of 13 and 17 are very much alarming and this happens before attaining the age of 20.They end up becoming “child farmer” and or “child labourer” on building construction sites in the community. This trend has been the case for years and new life international over the years (10yrs) has been the center trying to change this phenomenon. There are schools in the community but their outputs are nothing to write home about. Yes they exist. We want to establish our junior High School block so that we can give the children a proper education when it comes to teaching and learning. This will benefit the whole community. NLI has been the bridge to close the “educational gap” between the rural and urban schools specifically Ansapatu village, Cape Coast and its surrounding villages and towns in central region of Ghana. NLI admits needy, vulnerable and orphan children into our “children center” give them everything that a child would need. NLI currently cares for two categories of children namely: resident and non-resident. There are kids who reside in the children’s center and virtually live completely in the “home” ages between 11 months to 18 yrs while other children come from within the communities, attend free school and leave. Residents in the children center numbers up 45. Total children under review are 198. We will want to build 9 classroom blocks which would be used for teaching and learning. Two of the classrooms would be used for computer center and library and the rest for academic work (JHS or junior High School) inclusive). New Life Preparatory School is serving the children of the community who have been identified or brought to the center for support, but the larger picture is to ensure that the whole area benefits from the quality of education we offer. We need your support!" Akwaaba-- Welcome to our blog! We cover stories, news, and updates from New Life International Orphanage, Sankofa Children's Home and School, and Families for Children International, all located in Ghana, West Africa. In addition, we feature serial posts entitled "Issues Affecting African Children" and "News from the Continent" featuring information and encouraging dialogue on issues across the world affecting the children of Africa. "Impressions of Ghana," another serial post, is a series of photo essays designed to show the people, land, and culture of Ghana. Hopefully, this will increase awareness not only of these orphanages and organizations, but of the issues facing children on the continent in general. These orphanages are always in desperate need of funding, and especially love and prayers for the children. If you would like more information or would like to help, please contact Shallee! Join New Life International's Yahoo Group! All original content © 2007-2009 Shallee M.